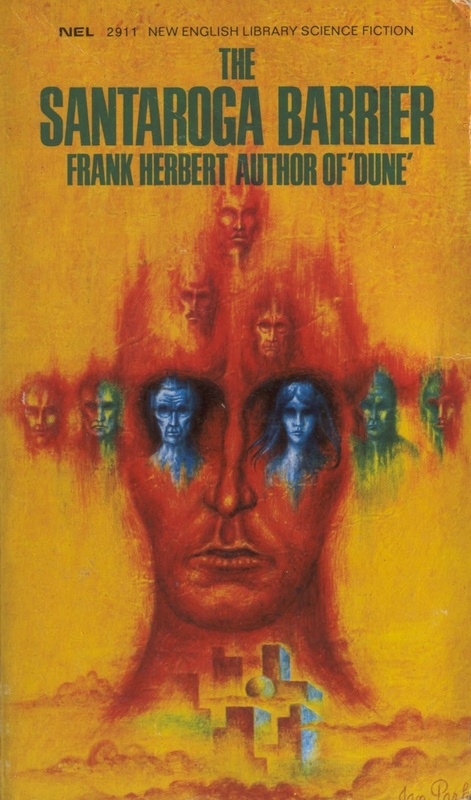 THE SANTAROGA BARRIER – Frank Herbert (1968) | Weighing a pig doesn't fatten it. I’m not too thrilled to write a review about this book. The Dune-series is among the best thing I ever read, so I hate to report that Frank Herbert didn’t even come close with The Santaroga Barrier. In short: this book is pulpy and feels dated. After about 100 of the 241 pages, reading it became a chore. The premise is interesting nonetheless, and Herbert manages to create an eerie vibe in the first couple of chapters. Gilbert Dasein, a psychologist, is sent to invest the valley of Santaroga, a prosperous farm community that has no juvenile crime and no one smoking, and that doesn’t allow outsiders to buy or rent property, nor does it allow cheese, wine or other produce from outside to be sold. Two previous researchers both died of accidents during their stay in the valley. Dasein has, aside from his professional endeavour, a love interest in Santaroga too. He’s in love with Jenny, a girl he had a relationship with at his university. A few months before the story starts, she has moved back to her native town. The story is situated in the 1960s, somewhere in California. Santaroga is mainly build like a mystery novel: what’s the deal with this town, and what’s the deal with those accidents? Plus, what’s the deal with those drugs!? Pretty soon it becomes clear that the Santarogans all eat something called “Jaspers”, a kind of drug. So, the book is a drug-novel too: references to LSD aplenty. Very soon, Dasein has a mysterious, near-fatal accident himself. At first, Herbert manages to convey the feeling of being an outsider quite well. I was engaged and interested. But the novel soon becomes formulaic: another accident happens, Dasein learns some tidbit of information, and yet another accident happens, new info, new accident, new info, new accident, etc. It shows that the story was originally published serialized in a magazine. After about 100 pages it becomes predictable and tiresome. It’s also pretty obvious early on that Dasein himself will become an addict, turning him into a Santarogan too. And – sorry to repeat myself – the mechanism behind the accidents is also pretty obvious early on. So, the only thing left is the question what this Jaspers is. Well, it turns out it is something “between a virus and a bacteria” and “fungusoid in some respects”. That’s about it for the big reveal. It doesn’t help that all characters are made out of cardboard either. Herbert writes a lot of lines wherein Jenny or Gilbert literally say “I love you”, but that doesn’t do it. I never, not once, felt that love come to life. It’s also very strange that the scholar Dasein has a hard time wrapping his head around the fact that he can’t betray this community and be part of it at the same time. The book is not entirely without merit. Ideologically, I can relate to parts of it. There’s quite some critique on certain aspects of Western society, television, the influence of big business on politics, and so forth, the usual suspects. But it’s all rather standard fare, sautéed in a sauce of philosophical Heideggerian mysticism about the Nature of Reality, and drugs opening the mind to the Unity of Everything. There’s also some unclear stuff about the nature of violence, instinct, education, the impossibility of objectivity, language and the nature of thought, and the relationship of all those things to civilization. It’s mostly disorganized, aphoristic rambling. That’s a shame, because these themes deserve better – surface references to Karl Jaspers and Heidegger (‘Dasein’) don’t do it either. It’s also worth nothing that none of the back cover premise (no juvenile crime, no smokers, etc.) is actually explored: the relationship between a drug that creates a kind of fundamentally empathic, connected and honest mind, and a society consisting of these minds, is left underdeveloped. Aside from a few expositionary pages with speeches from the town’s doctor to Gilbert Dasein – scattered throughout the book – the focus of The Santaroga Barrier is fully on the creepy mystery story. Were they really confident? he wondered. Or were they actors hypnotized by their own performance? This entry was posted in Reviews and tagged 1960s, Four Complete Novels, Frank Herbert, Review, Science Fiction, The Santaroga Barrier. Bookmark the permalink. My advice would be to just keep on reading the Dune series. The scope becomes more epic every book, and I really like the philosophical stance that becomes clear throughout them (Leto’s Golden Path), culminating in God Emperor of Dune & the awesome Chapterhouse Dune. This was my first non-Dune Herbert book too, and I was a bit surprised too. I have second hand copies of The Dosadi Experiment, Soul Catcher and Whipping Star on my TBR-pile, so they should get a review here somewhere in the future. I still have high hopes for those, especially The Dosadi Experiment. Pingback: DESTINATION: VOID – Frank Herbert (1965) | Weighing a pig doesn't fatten it.